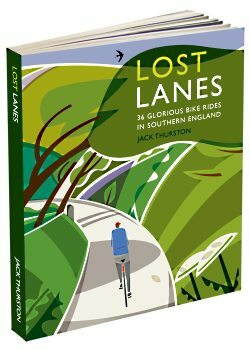 Lost Lanes – published today (see sample, or buy it online now) – is a fab cycling book by Jack Thurston, of Bike Show renown. 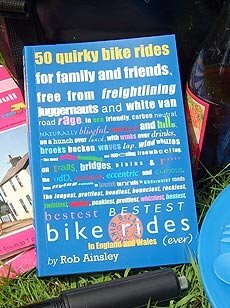 It’s a sort of routes-guidebook, describing 36 Home Counties rides; but it captures the real essence of cycle-exploring far better than the average cobbled-together routebook clone you see bookended in Waterstone’s. 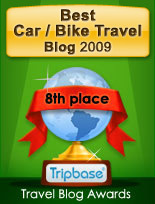 Real cycling, as Jack knows, is not about cycling; it’s about what else it enables you to do. Those of a cake-stop or pub-destination mindset will know exactly what I mean. And, indeed, the book’s routes – from marked ones such as the Crab and Winkle way to bespoke back-lane delights – are rated for, say, pub and good-food opportunities en route. But they also reveal the sort of mildly bohemian adventure you don’t usually associate with the posh South East: wild camping, wild swimming. It’s possible to see wildlife in London, of course, though this is usually the sort that throws stones at you on the Walworth Road. Lost Lanes gives you a genuine taste of wilderness, a more metaphorical stone’s throw from the capital. These routes don't require helmets, lycra longs, or a 4x4 with a bike rack (train access is listed for every route): only a sense of adventure. And, perhaps, a picnic, your trunks and tent. And your iPhone, to make your Facebook friends insanely jealous of your carefree, vibrant lifestyle.